I am wondering about all of the families and friends who settled in Christmas Eve to sit back, relax, and share a holiday movie but nothing was available for streaming. I hope they at least had cable. In case you haven’t heard, a big chunk of providers, including Netflix, relies on the servers of Amazon’s Web Service, better known as AWS, and that service happened to have a meltdown on Christmas Eve. According to the Wall Street Journal article, Amazon’s Snafu Rattles Customers, “Millions of Netflix customers from Canada to Brazil were unable to stream video on Christmas Eve after technical issues in Amazon’s servers in Northern Virginia felled service from Dec. 24 through the following morning.” No explanation has yet been provided. So, Amazon has some ‘splainin’ to do and some technology to tend to. In the meantime, I am using this opportunity create a kind of cautionary tale. Hence, the photo of the ring. “Yes, ma’am, what can we do for you?” I asked. “Terrified?” I asked her. I had heard of husbands going ballistic over things but of a television not working? Being “terrified” seemed a bit of an overstatement. Coming from a family of non-stop talkers, I didn’t appreciate that urgent gravity of her situation, but I could sense in her voice that she was indeed terrified. “I’ll pay anything…anything!” she promised. “The plug?” she asked, sounding annoyed. I was glad to have helped. I shared the story with my co-workers. They all laughed. “Dummy,” said the television repairman working in the backroom. I nodded. Yes, I was that girl, one and the same. “Well, God bless you. Thank you for saving my marriage.” She held out her hand and showed me a ring with a shining purple stone. “I make jewelry,” she said, “and I want to give you this as a token of my undying appreciation. You really saved my marriage.” She pressed the ring in my palm, gave my hand a hard squeeze, and walked out the door. I don’t know why I’ve kept that ring all these years, but when I come across it in a drawer full of old costume jewelry, I always remember that bride and her sheer panic. I hope that she and her husband learned how to have a conversation. When I read of the streaming outage on Christmas Eve, I wondered if there were any families or friends or couples out there who were thrown into a sudden panic that they didn’t have the streaming service they were expecting. The cautionary tale here is that it’s important to have a backup plan…like an emergency stash of DVDs to help you ride out future glitches with streaming technology. And just in case, remember to check the plug. The THRILLER television series (1960 – 1962) is an under-appreciated treasure trove for your Halloween watch list. The expertly crafted episodes feature compelling tales with twists and turns and startling, dark images that can be much more disturbing than big blobs of blood, guts, and over-the-top gore. Boris Karloff hosted this 67-episode tv series, featuring stories by some of the best writers of the thriller genre, including Robert Bloch of PSYCHO fame. Production quality is top notch from the spot-on, spine-tingling music to the lineup of directors, including Ida Lupino, actress and one of the first female film directors. They may want to leave the lights on when it’s time for bed. First it was big screen projection technology that dramatically changed the way we watch movies in our own abodes. And now we’re cozying up with small-screen tablets for in-home watching like never before. It’s predicted that by next year, “there will be more mobile devices than people” on our lovely planet Earth (source: IBM ad). My tablet has become a good little friend, like a pet, actually. I can hunker down to watch whatever, wherever, and whenever I want, and the magic is that I don’t even need to find the remote to use it. Best yet is that if I want to transform my tablet image into something big and cinematic, there are new projectors, like the less-than-three-pound Optoma ML500, which can connect to my tablet and transform the small-screen image into a big one — and for less than $600 too. All of this innovation is thriving with a little help from the streaming content boom. It seems that every day there is an announcement about expanded content availability on one platform or another. But now, instead of separately searching Netflix, Hulu, HBO, Amazon Prime, or other video content provider to find what we want to watch, Fanhattan lets us search across all of these platforms in one simple app. And the opportunities to nab huge quantities of streaming content continue to come at us at an extraordinary pace. In addition to its aggregating capability, Fanhattan recently announced a new WatchList feature, which allows users to add a show to a personal watch list and eagerly await a Fanhattan email when the show is available for streaming. I’ve been stumped sometimes, standing in a drug store or grocery aisle, just staring at the array of toothpaste, olive oil, soup, and organic cereal. Regardless of all the algorithm recommendations that appear on our screens, I can’t help but wonder how all of these content choices will impact our ability to make the final decision on what to watch. But I’m not complaining. Choice is good. A little overwhelming, to be sure, but good. 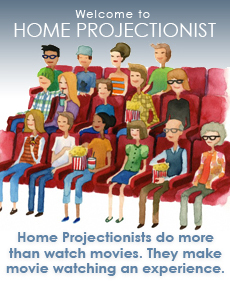 With big screens, small screens, streaming, and who knows what’s next, in a very short time indeed, everyone in the world will be a Home Projectionist. And in that, you’ll actually have no choice in the matter.